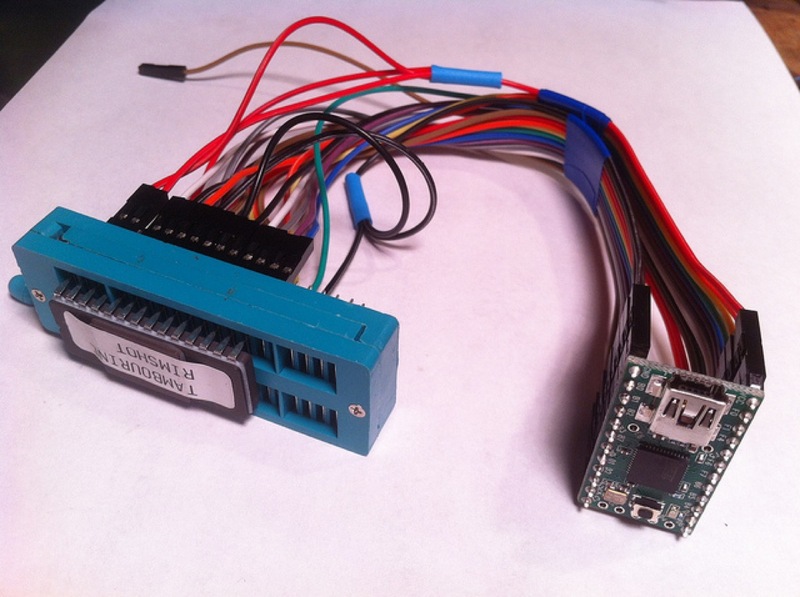 Breadboard-less ROM dumping – using an Adafruit ZIF socket and F/F premium ribbon cables « Adafruit Industries – Makers, hackers, artists, designers and engineers! Breadboard-less ROM dumping » NYC Resistor. Uses our lovely ZIF sockets and F/F premium ribbon cables – the pull-apart rainbow colored ribbon makes it a lot easier to do this sort of project without getting an eye-ache! So you want to dump a ROM, but don’t have a breadboard? Use a Teensy, some female-female jumpers and if you have one, a ZIF socket. The power and ground wires have been cut and three additional leads soldered to each one to provide hard-wired values for for Vpp, !PGM, !CS and !OE signals. To make wiring easier, prom.c maps the address lines sequentially down the left side of the Teensy, and the data lines sequentially down the right side. Up to 14 bits of address line are supported, allowing up to 16 KB PROMs to be dumped.